Here are some facts about Austria. Austria is a landlocked and mountainous country located in the very centre of Europe. It covers about 83,000 square km and is surrounded by 8 other countries. Vienna is the capital and largest city, with 2.4 million people, over 20 percent of the country’s population. It is famous for its grand monuments and public buildings, and its musical heritage. Many of the most famous composers were born in Austria, including Strauss, Schubert, Haydn and Mozart. The famous New Year’s concert of classical music has taken place in Vienna since 1939. Vienna’s Tiergarten Schönbrunn was founded in 1752 and is the oldest zoo in the world. The city’s central cemetery contains over 2.5 million tombs – more than the city’s population. Austria was part of the Holy Roman Empire during the Middle Ages. In 1804 the country declared itself to be the Austrian Empire, and in 1867 the Austro-Hungarian Empire was created. Almost 90 percent of Austrians speak German, the country’s official language. 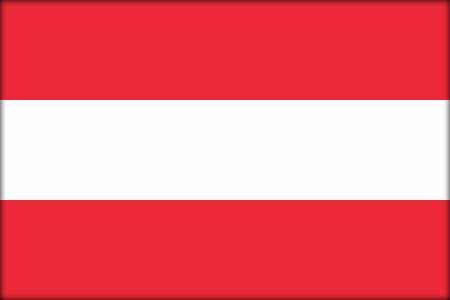 The Austrian flag of two red stripes and one white stripe is one of the oldest in the world, dating from the 13th century. Only about 30 percent of the country is below 500 metres in height. The Alps are popular with skiers and mountaineers, especially the Alpine resorts of Klagenfurt, Innsbruck and Bregenz. Millions of people visit Salzburg each year, the birthplace of the composer Mozart. One of the most popular films of all time, The Sound of Music, was filmed in and around the city. Austria’s highest mountain is the 3,798 metre high Grossglockner, which was first climbed in 1799. On the summit is a silver cross celebrating the Emperor Franz Joseph’s wedding anniversary. The sewing machine was invented in Austria, and the first postcards were used there. The founder of the famous Porsche car company was also born in Austria.